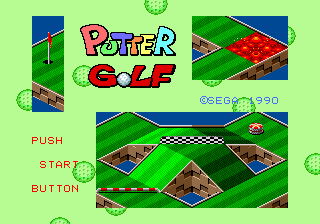 Putter Golf (パターゴルフ) is a golf game developed and published by Sega for the Sega Mega Drive. It was only available in Japan as a download through the Sega Game Toshokan service. Putter Golf is essentially (but whether or not it officially is is unknown) a Mega Drive version of Putt & Putter: a very simple golf game with an isometric perspective. Rather than compete on wide open courts however, the game opts for much smaller levels which would only require a putter (much like minigolf). As well as this, there are a number of obstacles which can get in your way, from bumpers to lava. Main article: Putter Golf/Magazine articles.